Rugby, business and innovation, or just a quiet Friday night in France! For those that know me, you know I like my sport and rugby in particular; I will watch a game wherever, if there is one on. Currently, I am in The Midi-Pyrenees, Tarbes to be accurate, working on the technical records for an aircraft that belonged to a defunked French airline. While here over the week-end, I decided to take the opportunity to go to a professional French rugby match, something I have always wanted to do. I grew up, particularly when I was at school in the 1970s going to Murrayfield, and watching the French supporters with their, bands, drums, noise, passion and the odd escaping cockerel! 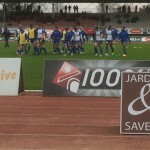 I duly wandered up to the Stade Maurice Trulet, for Tarbes v Colomiers; a bottom v top localish clash. I have to be honest the first half was a distinctly stodgy affair, too many mistakes from both sides. The second half was less error prone and the home side secured the winning points. I have been thinking about this game and rugby in general, has it has become risk averse and insular? Looking back at the recent World Cup, some of the rugby on show was less than impressive, particularly from the European teams, safety first, predictable and innovation free; one pass, contact, repeat until one team or the other makes a mistake. Accepted, there were exceptions, the All Blacks, Australia and Japan, however, I found a lot of the other rugby risk averse. Could the same be said about other aspects of life? Looking at other aspects of the club game there is even more evidence of the game reflecting parts of my industry, the increasing barrier to entry for new entrants; in the European league competitions, there is an increasing drive to ring-fencing the current players and preventing new entrants progressing from the lower divisions. This removes one of the biggest drivers in any field of endeavor, the desire to progress. The issue in England, and long may it be an issue, is that the owners of the Premiership clubs cannot agree when and therefore who should be ring-fenced in the lucrative future. There may be some famous old clubs that will not be challenging for titles and European glory in the future, London Irish, Bath anybody? So what is happening in aviation that mirrors the illustrations above? With a few exceptions, generally, from the low cost carriers and some manufacturing developments in the OEMs (Original Equipment Manufacturer), innovation is not the first choice of an operator, MRO (Maintenance Repair and Overhaul) facility or aircraft lessors. I am working at collating completed aircraft maintenance paperwork, to demonstrate to the leasing company and the next lessee, that the aircraft is compliant and meets the lease condition, there are other ways to do it, it takes someone with vision to change the way it is done! The common view is that people are cheap and will deliver the project; change will come when aircraft start returning late, or to prevent late delivery, they come out of service earlier! Either way, the airline loses out financially, lost revenue due to coming out of service early or fines for late delivery; heads I win, tails you lose! The innovation required is not necessarily technology based, though that can be done, it is innovation of management processes that can make a huge change, I have seen that work for a large fleet operator, who at aircraft delivery time has one additional contractor to support multiple deliveries. The regulators, who have a vital role to play in ensuring we are safe when we fly, need to look at themselves; I have direct experience of where I want to exploit technology to save time, save money for the charity and possibly save lives, it is an air ambulance, but the regulator says no! A classic example of regulator not wanting to see innovation, through a technology or process he does not/does not want to understand. There is one further related example, the introduction of a commercially available tablet, that has no interaction with any aircraft system, is merely a direct replacement for paper maps and the A-to-Z for a large city, has to be certified and controlled as if it is part of the helicopter flight control system, because it has a Microsoft product on it that has a security weakness that would allow a hacker to control the aircraft. It is not connected to the aircraft systems, not even for charging. Equally concerning, to my mind is the increasing barriers to entry being established, particularly in maintenance and support of the new generation aircraft. The OEMs are moving down the food-chain to establish MRO facilities that are dedicated to the newer types; these facilities, maybe under the “guise” of a partnership with an established operator or service provider, but the result is the same a lack of choice for airlines, an inability to negotiate on price for maintenance inputs. Where an operator tries to challenge the OEMs over maintenance choices, there are issues over access to required data, access to material and spares. The provision of maintenance and operational data must not be used as a bargaining chip between an operator and the OEM, it should be the operators as a right! The OEMs are seeking to collect ever increasing amounts of data, flight hours, flight cycles, defects etc through their onboard systems, that data belongs to the operator, not the OEM, and not the MRO, European regulations require the operator to have full control and more importantly full understanding of their aircraft; aircraft operating must be available to the operators. In rugby, one coaching style does not suit all environments, cultural and historical backgrounds, individual coaches need to look at what is happening around the world and not be afraid to cherry-pick those things that will work for their team. Coaches and clubs need to realise that they are “entertainment” now not just a sporting club and that the paying public, might, vote with their feet if they are not entertained with the current one pass contact structure. The boys I have coached need to have that dream that the club they play for today might find a benefactor and can progress from Eastern Counties, or wherever, through the next levels and on to the Premiership, promotion and relegation must stay! In my industry, we must get away from the “not invented” here approach, if something works in operation A, it should be assessed to see if it will work in operation B. The regulators must work to ensure that technology and regulation are matched, we should not, not be employing technology purely because the regulation was written before smart phones and tablets were available! Access to and use of maintenance and operation data must not become a weapon to prevent airlines from choosing their maintenance provider, they must not be pushed in the direction of the OEM. For some of the worlds marquee airlines, that might be the way ahead, they have the power to sway the OEMs, the second and third tier airlines do not; their will only be one loser, the flying public! As usual I look forward to your thoughts and comments, be kind! This entry was posted in innovation, regulation, sport and tagged aircraft operations, compliance, maintenance. Bookmark the permalink.